Are You Still Competing With Short Sales & Foreclosures? 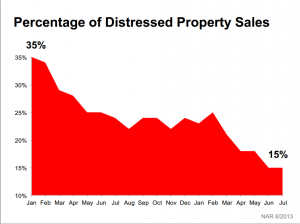 For the last 5 years the stiffest competition on the block was the distressed home. In the need to liquidate, they slammed prices lower and lower which, of course, had an impact on the entire market, including the regular equity seller. As you can see, the number of distressed sales has significantly declined in the last year and a half. This means that your competition now is your neighbor who also wants to sell their home and move to the subdivision down the street. This is great news for the regular seller. Values have increased by record amounts, reclaiming much of the ground lost, inventory is still at an unsustainable low, and interest rates are still at a historically insane low. Less competition, more buyers than sellers, cheap money with low interest rates. I can confidently tell you that NOW is the time to sell!! Wan to know what your home is worth in TODAY’s market?